I was knitting away on the Op Art blanket yesterday, having managed to get a fair bit done (unblocked the width is about 41cm) and there’s a lot more to go. When my hands got a bit achy I switched to spinning for a while, but sadly it didn’t keep my interest. This morning I did the only thing I could do. I cast on another project. I casted on some socks. 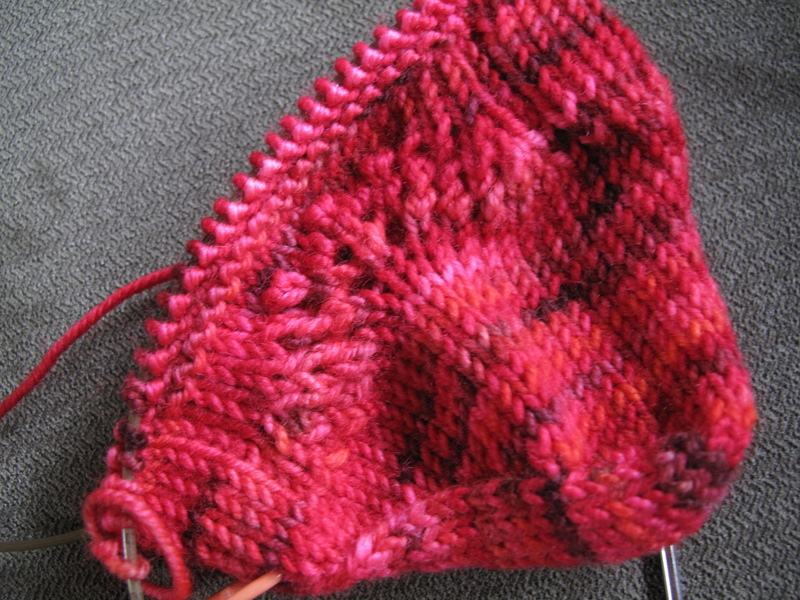 Sock yarn is guilt-free, so it makes sense that sock projects should be guilt-free too. I had signed up to some Craftsy classes over Christmas when they were going cheap. I thoroughly enjoyed Stefanie Japel’s ‘Fit Your Knits’ class and got a tremendous amount of knowledge and practical tips for future jumper knitting. I also purchased at the same time, Donna Druchunas’ Knit Sock Workshop. The workshop features two patterns, one of which I’ve been wanting to make for a few months. Enter the diversion project, ‘Ladies Lace Socks’. I have now completed my very first ‘swirl toe’, which I’m quite taken with and I’ve completed one lace repeat. Guess it’s time to head back to the blanket now, fair’s fair.